Replacing foot wraps every time medication is re-applied can be expensive and time consuming. Foot wraps, if applied incorrectly, can actually harm your horse. The Slipper replaces a foot wrap altogether. This unique product allows the hoof to breathe and prevents hoof sweat while being treated, which helps to promote a healthy hoof. The body of the Slipper is made of a heavy ply Cordura®, is fastened to a high-grade leather base with an abrasive resistant and chemical resistant tensylon thread and fastens with industrial strength Velcro®. This durable, yet pliable material allows a comfortable fit and makes them safe and easy to apply. The soft padding around the top of the Slipper gives the horse a comfortable fit, eliminating the chance of cutting or digging often experienced with other equine boots. This product is 100% machine washable and is designed for multiple uses. The Equine Slipper is tailored for maximum adjustability and fit. The four sizes, along with adjustable Velcro®, allow for a custom fit for all normal hoof variations. 1. 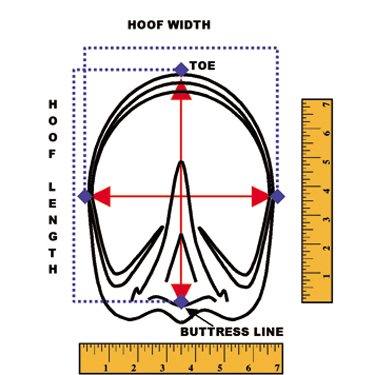 Measure the widest part of the hoof. 2. Consult our sizing chart to determine the appropriate size.